RAM Services, Inc. provides radioactive sealed-source leak testing to clients worldwide.Our leak test processing is tailored to serve each client's needs. We provide rapid turn-around on leak tests and survey instrument calibrations. 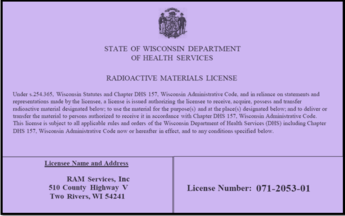 RAM Services, Inc.is a full service licensed radioactive waste broker. Choose the links above for more information. Copyright © RAM Services, Inc.. All rights reserved.